Plaza de Armas was known as Huacaypata (Warrior Square in quechua) in Inca times and is believed to have been designed by Manco Cápac. Cuzco, which was the capital of the Inca Empire, was designed in the shape of a Puma to reflect their Inca animal mythology. Historians proclaim the plaza was intentionally built at the location of the heart of the Puma, in the center of the city. The location of the Plaza is no coincidence. The Plaza is used for most of the city’s events, gatherings, and festivals. Historians feel that the Plaza functioned as the cultural center, or "heart," of the Inca Empire. In 1532 Spanish Conquistador Francisco Pizarro defeated the Inca Empire and took control of Cuzco, renaming the Plaza to "Plaza de Armas." The Spanish reduced the size of the Plaza by building two Churches, La Catedral and La Compañia. La Catedral was built where the palace of Inca Wirancocha once stood. La Compañia was built in 1571 by the Jesuits during the time of Wayna Capac, the last ruler of the unconquered empire. An earthquake in 1650 destroyed the church leading to its immediate reconstruction, which resulted in one of the most beautiful churches in Latin America. The Plaza de Armas portrays the city's diverse history while remaining the center of Cuzco life and culture. Actually, people often cross through the Plaza as a short cut away from traffic or to avoid the curvy roads of Cuzco. The Plaza is most accessible by foot, but people often arrive by car. The most common meeting location for tourist groups is at the entrance stairs of La Cathedral in the Plaza. The Plaza is located at the center of the City and is accessible from all directions, making it a great meeting location. At first you’ll observe the high velocity of people circulating throughout the Plaza. This is comforting for persons new to the area. Vehicles tend avoid the street adjacent to the plaza and also yield to pedestrians. The Plaza is well lit and offers various nooks and crannies to socialize in or to just be alone in. Around the plaza, you will see many children and adults either trying to sell you some small crafts (e.g. finger puppets, postcards, paintings, etc.) or simply begging for money. The beggars may appear poor, and you will feel sorry for them, but you will soon learn that these people are simply lazy and do not want to work for money. The Plaza is used for special events like festivals, speakers, concerts and art exhibits. It has been the center of activity throughout the history of the city, and was the scene of important ceremonies, including the annual Inti Raymi or Sun Festivity. 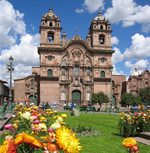 Plaza de Armas is the central and an important destination in Cuzco. Peru tours are a popular way to explore the Cuzco and visit this beautiful Plazas.